As a former teacher of biology I have a considerable interest in the structure of plants and other organisms. 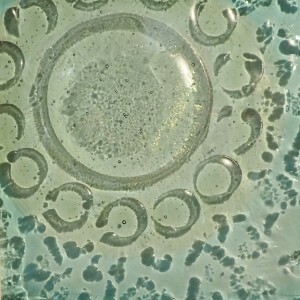 These works are inspired by the unseen microscopic world which is all about us. Plants look just as marvelous from the inside. and specimens can look beautiful under the microscope. This represents the arrangements of tissues in a stem. 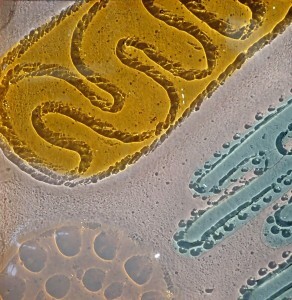 There are amazing shapes in the electon microscope pictures of cells. This represents structures inside a human cell: a mitochondrion, nucleus and endoplasmic reticulum. 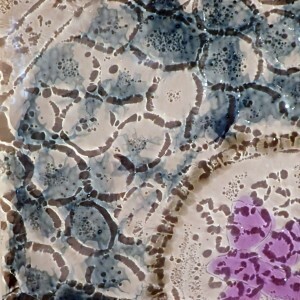 This represents the arrangements of tissues in a root as under the microscope.